That said, 2014 is my Year of Reading Adventurously. I’ve read a romance novel and a graphic novel… so why not try a horror novel as well? When Wensend and Fourth Street Review announced King’s March, a month-long Stephen King reading event, I decided that now was the time to step outside of my comfort zone and read something scary. I chose to try The Shining because I’ve seen the movie (I actually love it, despite my usual aversion to anything scary) and I thought the book would be less scary if I already knew the story. When I announced on Twitter that I was about to start The Shining, I got quite a few “keep ALL the lights on” messages. But you know what? I was never really scared. Horror movies really get to me with their mood-setting music and the ability to actually SEE the scary things that are happening. Reading about scary things happening didn’t bother me at all, though. Sure, it was creepy, but I never felt like I needed to lock the door or check to make sure the trees outside weren’t moving on their own. At first I thought, ‘maybe I’m not scared because I know what’s coming.’ But the book is VERY different from the movie, and there were a lot of spooky scenes that I didn’t know were coming. I just felt distant from what was happening. I also wasn’t impressed by King’s writing. It felt kind of clunky, and I couldn’t really sink into it. Perhaps the constant POV switching also kept me at a distance. Whatever the cause, I wasn’t scared. There were a few heart-pounding suspenseful scenes, but that was about it. 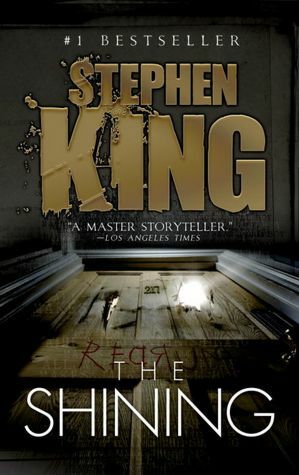 For those of you who read horror or are familiar with King’s work, what’s your take on this book or reading horror in general? Did I just pick a bad book to read? I love the movie and have been thinking about reading the book but I’m a scaredy-pants as well. You’ve reassured me that it won’t be a horrific experience so I’ll definitely give it a try now. I’ve never read any King, but have a few in the 746 (this included). I’m looking forward to reading The Shining, just to see how it differs from the movie which I love. I thought the book was soooo much scarier than the movie. In fact, the movie was pretty awful and not very scary at all. Haha! The book FREAKED ME OUT. I don’t read a lot of horror novels, but the ones I have read haven’t really scared me. I find them more suspenseful than scary. And they never stick with me, which is maybe why I’m not so interested in them. Every once in a while, though, they are fun to read. I just read The Troop by Nick Cutter, and I really enjoyed it. I don’t read a lot of horror, and I haven’t read The Shining, but the scariest book of Stephen King’s (to me) was The Pet Semetary. I am not good with horrors, so maybe that’s why I stay away from Stephen King. I saw the movie and after 5 min I was done watching. I’m glad you didn’t find this too scary, but I think once I read one of his books, it won’t be this one. I have such a great suspension of disbelief I usually freak myself out and avoid horror movies like the plague. I did just read (and watch) Misery and I would definitely recommend both! The book was much better. I’ve never seen or read The Shining, but I probably will at some point, King has grown on me after reading two in the past year. I’m like you, I absolutely hate being scared. But, I’ve yet to read a horror book that actually scared me… which is great for me, because I like the suspense. As for The Shining specifically, I thought the book was slow at times, but I didn’t find it clunky. It’s actually among my favorites of his. But he does bounce around between different characters a lot, so if that’s something you don’t like, then that’s going to get in the way of enjoying a lot of his books. You might try The Green Mile or Misery next. The Green Mile is in 1st person, and Misery is in 3rd but mostly stays with one character. I agree! Realistic things scare me more — like Room by Emma Donaghue! Now, that is a scary book because it could happen to anyone! I’ll keep Gerald’s Game in mind! Agreed! Room was terrifying to me, but I loved it! I’m surprised to hear you say his writing was clunky. I’ve read On Writing and he specifically says not to use many adverbs and adjectives – i.e. – don’t be clunky! Maybe clunky isn’t the write word, but I just didn’t think the writing was very good. I was talking to a co-worker who is a King fan, and it was his opinion that some of King’s early books aren’t super well written, but that the writing gets much better throughout his career. I’m interested to hear what others think. I have the same thing…scary movies freak me the heck out! But reading not so much! I figure my imagination limits itself. But I can’t read a book with a scary cover…it counts as a visual. Goosebumps covers scared me so much as a kid! Maybe my imagination isn’t quite strong enough. The scary things I read don’t feel real enough to really scare me. Pet Semetary is the scariest, I think. It’s really disturbing. I don’t care for The Shining, particularly, it’s not even in my top ten. I typically recommend The Stand to most people, or The Green Mile if you don’t like being scared. For what it’s worth, my favorite is Bag of Bones. I don’t read much horror and like you, I avoid scare movies. However, I really enjoyed The Shining and everything else I’ve read by King. I also agree that movies are usually far scarier than books! Something about seeing what’s happening is just creepier. I grew up reading Stephen King and love his writing. I think The Shining is actually one of his better books, but I am rarely scared when I read a book. Like you, I find horror movies much scarier, and even as an adult have had to leave the lights on when watching some, and am too scared to sleep sometimes afterwards. Although King is someone I will always read, I don’t necessarily like all of his books. I tend to enjoy his short story collections, particularly Different Seasons which included the stories that the films Stand By Me and The Shawshank Redemption were taken from. I wasn’t impressed by King’s writing either! I was so exciting to read The Shining (only having read Dolores Claiborne before, which I remember liking), because I love the movie. And I was ok with it being different. But I just genuinely thought it was not as good. It didn’t feel like King knew how to write people. Jack just felt like the end of an equation. A name assigned some traits and a stereotypical backstory. I just couldn’t get into it, and I love horror. Haven’t read a King book since then, and I feel kind of bad about it.